Military Grade Knives of all types from top manufacturers. We carry FirstEdge, CRKT, Cold Steel Knives, Smith and Wesson Military and Police Knives, SOG Knives, United Cutlery Knives, Gil Hibben Knives, Large Bowies and Survival Knives. CRKT Hammond Cruiser knivesM feature a black 3 ¾ inch partially serrated blade. The 8Cr14MoV stainless steel clip point blade is engraved with CRKT. This EDC knife is 5 ¼ inches closed. The green Zytel handle features a thumb stud, pocket clip and a functional lanyard hole. Buy the Hammond Cruiser knives for $29.99. CRKT Crawford Kasper Linerlock knife features a black 3 7/8th inch partially serrated 8Cr14MoV stainless steel drop point blade. This EDC knife is 5 3/8th inches closed and has a green Zytel handle. The handle features a functional lanyard hole, a thumb stud and a pocket clip. 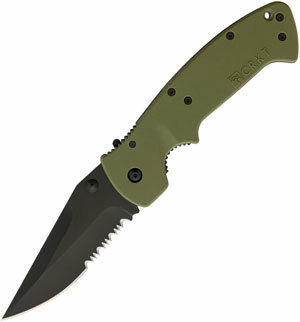 Buy the CRKT Crawford Kasper Knives for $29.99. 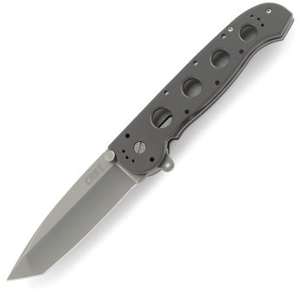 CRKT M21 G-10 Linerlock knives have a grey 3 7/8th inch TiNi coated stainless steel blade. This EDC knife features an extended tang and measure 5 ¼ inches when closed. The black G10 handle has a thumb stud and pocket clip. They also feature an AutoLAWKS safety. 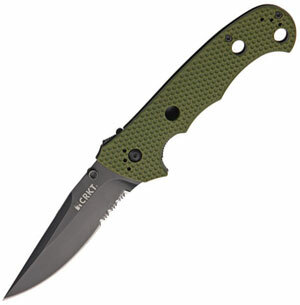 Buy the CRKT M21 G-10 Linerlock knives for $69.99. CRKT Homefront Hunt Knives have a 3 ½ inch satin finish stainless steel drop point blade. They are 4 ¾ inches closed. This extended tang knife has a Realtree XtraCamo handle that has a pocket clip. The also feature breakthrough Field Strip technology that permits disassembly with ease for cleaning without tools. 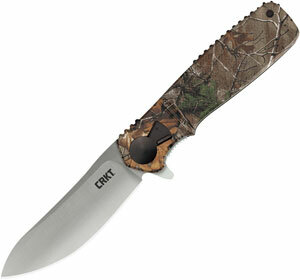 Buy the CRKT Homefront Hunt Knives for $79.99. CRKT M16-04S Classic Locking Liner Knives are popular everyday carry knives that are inspired by the legacy of by Kit Carson. The CRKT M16-04S Classic Knife features the original M16 design with an AUS 8 stainless steel tanto blade. They are 9.31 inches overall in the open position with a 5.34 inches closed length. The AUS8 tanto style blade is 3.9 inches with a 0.14 thickness and 57-59 HRC. They have a hollow grind, plain edge and bead blast finish. The handle is made of 6061 aluminum with a 420J2 liner. They weigh 5.5 ounces. Buy the CRKT M16-04S Classic Knives for $79.99.